Suwanee, Ga. (October 30, 2012) – When the time comes for Jeep® owners to replace their vehicle’s aging soft top, they’refaced with the daunting task of choosing a proper replacement. Omix-ADA®, a leading manufacturer of high-quality Jeepaccessories, has now made this long-difficult decision much easier for Jeep owners with the availability of its new RuggedRidge Bowless XHD Soft Top with Door Surround for 1997-2006 Jeep TJ Wrangler. The Rugged Ridge Bowless XHD Soft Top is the most versatile Jeep soft top on the market, transforming from a full top to a summer brief in seconds. Theinnovative design completely eliminates the need for the bulky OE soft top frame, creating an aerodynamic “fastback” look. The Bowless XHD Soft Top fits snugly over the factory roll bar and retains the factory door surrounds andtailgate bar to provide an air tight fit. Manufactured to the same specifications as the factory replacement tops, the Bowless XHD Soft Top features reinforced stitching on the heavy “pull” areas,heavy duty 30 mil thick DOT approved window glass with 31% tint, durable vinylcoated polyester and cotton fabric, and seams sewn with marine grade thread toprevent deterioration or discoloration from the sun. Each soft top kit alsoincludes all necessary hardware for installation as well as aftermarket door surrounds to replace damage or missing originalpieces. “Although the TJ Wrangler has not been in production for some time, we know thatJeep owners have a strong attachment to their vehicles and hold on to them formany years. We developed the Bowless XHD Soft Top to be the last soft top Jeepowners will ever buy, bringing modern style and convenience to older Jeeps.” saidPatrick Bennett, Product Development Manager at Omix- ADA. 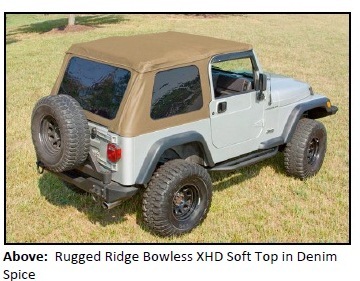 Rugged Ridge Bowless XHD Soft Tops are covered by an industry leading five-yearlimited warranty and are available online and through select Jeep and off-road parts/accessories retailers nationwide, starting at $379.99 (starting at $529.99 forXHD Bowless Soft Top with Door Surround). 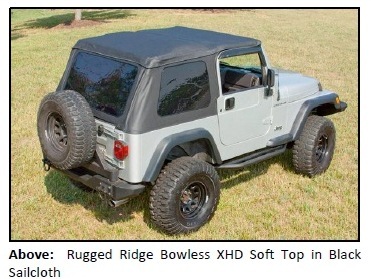 For more information on Rugged Ridge’s complete line of high-quality Jeep and off-road products, or to find an approved retailer, please contact Rugged Ridge at (770) 614-6101 or visit their website at http://www.RuggedRidge.com. Omix-ADA®, Inc. is the world’s largest independent manufacturer and wholesaler of Jeep®, truck and off-road parts, accessories and floor liners. For nearly two decades, Omix-ADA has designed, tested and manufactured more than 15,000 of the highest quality restoration and replacement parts and accessories. The Omix-ADA family of brands, Rugged Ridge® and Alloy USA® aredistributed throughout the USA and in more than 50 countries worldwide. For more information, please call Omix-ADA,headquartered in Suwanee, GA at 770-614-6101 or visit http://www.omix-ada.com.